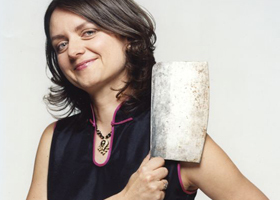 Fuchsia Dunlop is a cook and food writer specialising in Chinese cuisine. She was the first Westerner to train at the Sichuan Higher Institute of Cuisine, and has been traveling around China collecting recipes for nearly two decades. She writes for the Financial Times, The New Yorker and The Observer, among others. Her latest book Every Grain of Rice (Published by Bloomsbury, Aug 2013, RRP 54.99) is inspired by the healthy and vibrant home cooking of southern China, in which meat and fish are enjoyed in moderation, but vegetables play the starring role. Her previous books include the award-winning Sichuan Cookery, Shark’s Fin and Sichuan Pepper. Fuchsia grew up in Oxford, and studied at Magdalene College, Cambridge University, Sichuan University, and later at the School of Oriental and African Studies in London. She first became interested in China through a sub-editing job at the BBC, which led her to take evening classes in Mandarin, and eventually to win a British Council scholarship to study for a year in the Sichuanese capital, Chengdu. This exceptionally quick and easy dish is a Fuchsia Dunlop favourite. Usually served as an appetiser, this salad makes a smoky, aromatic side dish.